As I’ve recently been organizing and running tournaments and events at my FLGS, I’ve encountered a curious phenomenon. 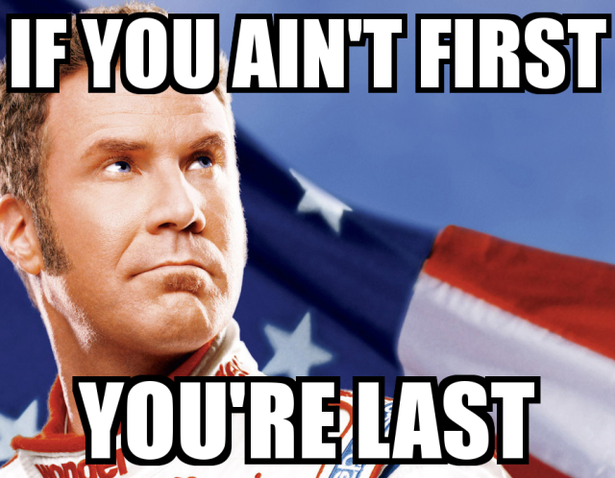 I’ve begun to run into gamers who have not encountered a tournament that wasn’t based on the win/loss criteria. As I do not currently run win/loss events, this had led to some confusion and consternation on the part of some tourney participants. That’s what prompted some thoughts on our recent podcast and for this article. There appear to be large deficiencies awakening in our wargaming hobby. It seems that people have categorized players into two categories the Win-at-all-Costs gamer and Fluff-Bunny. Like all simplifications, this is grossly inaccurate. Before I continue, perhaps some definitions are in order. A win/loss tournament scoring system, is just what it says on the tin. Wins count for a lot of points. Losses count for no points (or so few points that they are negligible). In most win/loss tournaments, there are no points awarded for army composition, theme, paint scoring, sportsmanship, etc… Really, only winning the games count. If there are prizes for other aspects of the hobby (Painting, etc…) they are usually doled out as separate compartmentalized prizes sequestered from the main tournament itself. I would consider the Independent Tournament Circuit (ITC) tournaments to be good examples of the win/loss format. Though there are others out there. 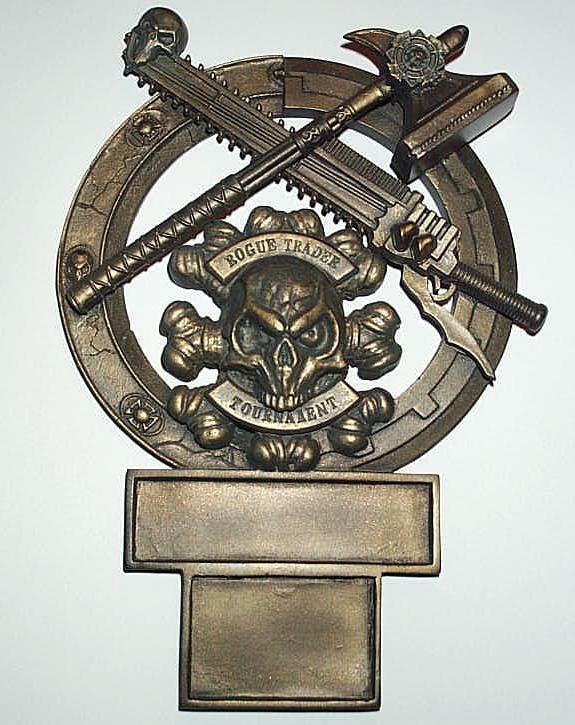 By contrast, a hobby-centric tournament awards points for winning the games, but factors in other hobby scores such as theme, paint scores, army composition, and sportsmanship. Losses in a hobby-centric format are not nearly as damaging as in the win/loss format. Often, there will be a spectrum of victory ranging from major defeat, through minor defeat, draw, minor victory, major victory. Each stage carrying with it a set point value. Prizes for the top performers in different categories are awarded and the prizes are not compartmentalized. Often this system will include a Best Overall or Renaissance Man category, awarding the player who scores highly across all aspects of the hobby. The Bringing-the-Hobby-Back (BHB) Format and GW’s old Rogue Trader Tournament (RTT) format are good examples of the hobby-centric tournament format. GW, please bring these back! There are advantages and disadvantages to both systems, neither is inherently superior to the other. But at the time of this writing, one format is inarguably more popular than the other. And that has largely to do with the ITC. Now perhaps I should take a moment to talk about the ITC, lest readers mistake this for a screed against that format. I enjoy the ITC and after Games Workshop’s abdication of responsibility for maintaining the game (FAQ’s and Errata’s) and withdrawal from organized play and tournaments, the ITC really stepped up and saved the tournament scene. The organizers and judges behind the ITC Faq and format can’t get enough praise for doing this. I’ve said before that after the advent of 7th Edition 40K, if it weren’t for the ITC, I don’t think I’d still be playing the game. The tournament scene is flourishing because of their efforts. That having been said, it isn’t the only way to play competitive 40K. In the rise of the win/loss format since 6th edition 40K, we’ve lost out on other aspects of the hobby. (I should add that many of the following observations ring more truly at the local level than at larger tournaments like Adepticon or the Las Vegas Open.) Painting has suffered. Especially at the local level. In GW’s RTTs, you had to have armies painted to a 3-color minimum or you couldn’t participate. As RTTs went the way of the dodo, local tourneys began to relax standards to not turn away participants. The standard became that if your army wasn’t painted you were ineligible for awards. Now, it is not unusual to see participants in local tournaments fielding unpainted or simply primed armies. WYSIWYG (What You See Is What You Get) used to be a requirement. Meaning that the models in your list and the majority of their equipment had to match the models on the tabletop. This has long gone by the wayside and given way to professionally crafted and scratchbuilt proxies, often for some of the most expensive and overpowered models in the game. Theme has gone away nearly completely and remains only loosely relevant due to the constraints of the Allies Table (note numerous lists of Taudar, Eldar/Imperial builds, or Space Wolves allying with Dark Angels to get a little Ravenwing boost. As a long time Space Wolf player, I just threw up a little mjod just thinking about it. It’s the second-cousin of heresy). Participants have little to no incentive for fielding accurate painted models in lists that fit the background material of the game. How do we fix this? Start rewarding players for theme, modeling, and painting. The hobby-centric format addresses this. These are not the only things that have suffered. In the quest for all-encompassing victory, often executed as quickly and decisively as one can, the social contract between players has taken a significant hit. The game has become less about a group experience and more about an individual experience. Nearly anything is acceptable, as long as it helps a player achieve victory. An opponent’s tabletop experience seldom matters at all. The idea that your opponent’s experience is every bit as important as your own, has fallen to the wayside. This is a subset of a tiny hobby. Miniature wargaming is really a small group of hobbyists and among those hobbyists, 40K is a subset of that. Just meeting a fellow 40K player should cement you as BFFs. And yet in recent years, that’s not what happens. Folks view each other as adversaries instead of best friends. The hobby-centric format helps to address this, when sportsmanship values and army composition values enter the mix, it forces players to at least consider their opponent’s involvement. Exploiting rules loopholes has become more than commonplace. It is now the norm. 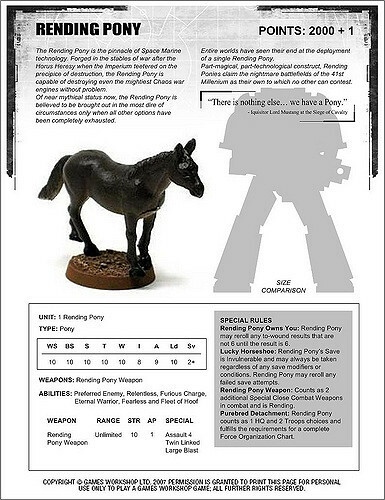 Imbalanced and overpowered units have been spammed in lists since the game’s inception, but now it’s become a sort of perverse arms race where players feel their armies are doomed if they don’t maximize these units, or if they don’t field the latest Forgeworld Rending Pony, no matter if they can afford the model or not. Which, given the expense of the hobby, of course has given rise to brisk trade in “counts-as”, proxies, and bootleg figures. And while decisive and expedient victories are greatly desired in actual warfare. They shouldn’t be the end goal of a social game. Yet, when winning is the only thing tourneys reward, winning becomes all that matters. While winning is part of the hobby, it isn’t the ONLY part of the hobby. So then why should it be the only portion rewarded? Consider the average player. What percentage of hobby time does he or she spend on assembling the models? Painting? Reading codices and rules to field a force? Versus actually rolling dice on the tabletop. The ratio of hobbying to actually playing is skewed heavily in the direction of hobbying for most people. And yet we as tournament organizers have been rewarding the smallest piece of that pie? There’s room in the hobby for different formats. And with the ITC having salvaged much of the tourney scene, and with GW’s recent very positive about-face with regard to their engagement with the community, the time has come to bring some hobby love back to tournaments. (Ideally, I would love to see GW support of a revamped Rogue Trader Tournament scene, but that may still be a ways out). But this is where we enter the Danger Zone, my friends. As tournament organizers we need to be exceedingly clear on what format we’re going to run for our tournaments and manage expectations as best we can. When a hobby-centric player enters a win/loss environment and gets decimated that’s not a good thing. Likewise when a regular win/loss player enters a hobby-centric format and finds themselves not in award range due to poor painting, theme, and composition scores despite their victories. This makes no one happy and that hurts the hobby instead of helping it. I feel that the win/loss format is already missing out on many hobbyists who simply do not enjoy that style of play. But what about win/loss players entering the hobby-centric format? Some for perhaps the first time? Bringing their win/loss capable force into the hobby-centric environment is not ideal. So how to tailor lists and set criteria to maximize the enjoyment of all participants? Well you’re a regular win/loss tourney player and can claw your way to the top tables of your local scene pretty regularly. You’re used to trading blows against other adversaries with beatstick lists using the craftiest combinations in the game. In the system you’re accustomed to winning is all that matters and that’s the way you’ve played the game for so long, you might not remember what it was to play the game competitively for the joy of the hobby at large. Now, your local FLGS is holding a hobby-centric tournament with scores for painting, army composition, theme, and sportsmanship. You’d like to play in it. However, you realize that your normal tournament list might be too overpowered for this particular tournament’s meta. Which would create some feel-bad experiences on the tabletop and hurt some of your scores. What to do? Fear not, citizen. We’ve got some quick guidance for you that will get you back on the tabletop and having a blast in more hobby-centric tournaments in no time. The first thing you should do is take your list and lay out your army on the table. Look at it as a prospective opponent might assess it. Is everything painted? No? Then fix it. 3-colors are all you need. There are copious tutorials on the net on how to do this quickly. (Colored primers, drybrushing, dipping methods, and washes are your friends here). You’d be amazed how good you can make things look with just 3 colors. No one says you need to be in the running for Best Painted overnight. Before each tournament, go through this ritual again. Touch up and augment. Add details such as eyes, unit marking, etc… Before you know it, you’ll have an impressive looking tabletop force in the running for the top painting award. Is everything modeled accurately? There isn’t an overuse of proxy models? Remember this is a tournament not a playtest. While using your scout snipers to represent wraithguard might work during a playtest, that shouldn’t fly at a tournament. Is the list exploitative? Does it take advantage of a rule loophole or multiples of the same overpowered unit (spamming)? If you answer, “Yes”, you probably need to tweak your list. If you took that loophole/unit away, and replaced it with a similar pointed unit, is the list still playable? If you answer, “No”, you probably need to tweak your list. Does your list/army represent and honor many aspects of the hobby (Modeling, Painting, Story) with conversions, great looking miniatures, compliance to the game’s background material or to some background material you’ve developed? If the answer is, “No”, fix that. Would you have fun playing against this list? If you answer, “No”, you ABSOLUTELY need to change your list. It takes a great hobbyist to beat their opponent and leave them with a smile on their face and talking about how great a game it was. (Some of my favorite games of 40K that I can remember, were games that I lost!) To do that while having a Balanced List, AND having it well modeled and converted, during a tournament…that’s the height of the hobby. It doesn’t take a great tactician or list creator to spam the same imba unit over and over and then drop 3 colors on it. Anybody can do that. 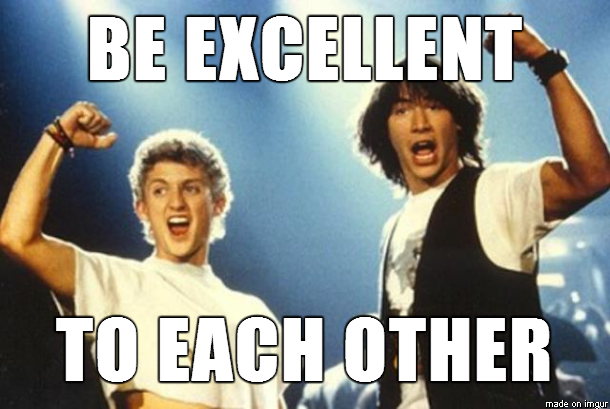 Be excellent to each other. Play nice. How one achieves victory is at least as important as the victory itself. This list above is just begging for two more entries to make it a nice round 10 items. What are two more criteria you would add to the list?